A stage version of All About Eve has been long overdue. It started life as a short story in 1946, then became the 1950 film starring Bette Davis. Despite its theatrical setting, it has taken almost 70 years to make it to the stage. It’s a story ripe for retelling. The two leads are female; power, sexuality and agency are integral to the story. Margot Channing (Gillian Anderson) is the theatrical star at the centre of the play. Her lover is a younger man, stage director Bill (Julian Ovenden). Her closest friend Karen (Monica Dolan) is married to playwright Lloyd (Rhashan Stone), in whose plays Margot stars. All has been going swimmingly for years. But Margot – at 50 – is straining credibility in portraying the ingénue roles which are Lloyd’s stock in trade. Into this world steps Eve Harrington (Lily James), a super-fan who has seen every performance of Margot’s. Eve wants nothing more than to be in Margot’s presence, at her beck and call. With Karen’s support, Eve is soon indispensible. But Margot starts to suspect that Eve may have a different agenda, one which advances Eve at Margot’s expense. The dynamics of this group are an important psychological factor, as power shifts between the women. The Machiavellian Eve has a plan, and the personality to implement it. In contrast, Margot’s actions are spontaneous and out in the open, unafraid of conflict or its consequences. The production relies heavily on director Ivo van Hove’s signature meld of stage acting with on-stage cameras, last seen at his National Theatre production of Network. Clever use of mirrors and cameras allows us to see Anderson’s luminous face, projected large, react minutely to Eve’s story of how she became such a fan. But the constant projection of off-stage and out of sight action, rather than providing a commentary on the gap between public and private faces, sometimes gets in the way of the acting. There is no doubting the star power which Anderson brings to the production. It’s not hard to believe the devotion of those around her, and Eve’s obsession with her, despite Margot’s diva temper tantrums. Anderson is a physically tiny presence who dominates the stage. But the production does not fully exploit her considerable talent – although there is the rare chance to hear her sing (P J Harvey wrote the original music for this production). In the film version, there are hints that Eve is sexually attracted to Margot. This is ignored in this version, a puzzling decision which renders their relationship less interesting. Also in the film, the older, more talented woman is threatened by the younger woman’s age and looks. This is replicated in this version, with the sole concession that Bette Davis was worried about approaching sexual redundancy at 40, instead of 50. Margot’s obsession with the relatively small age difference between her and Bill strains credibility, when talented women such as Sam Taylor-Wood and Tilda Swinton have partners decades younger. Margot’s life choices are depressingly hetero-normative, and presented without critique. 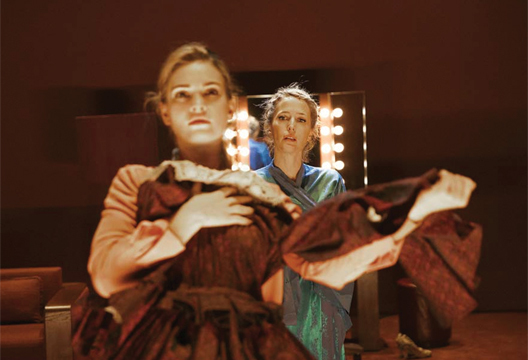 So whilst worth seeing for Anderson’s performance and the slick design, All About Eve is a missed opportunity to update a classic story of female competition.